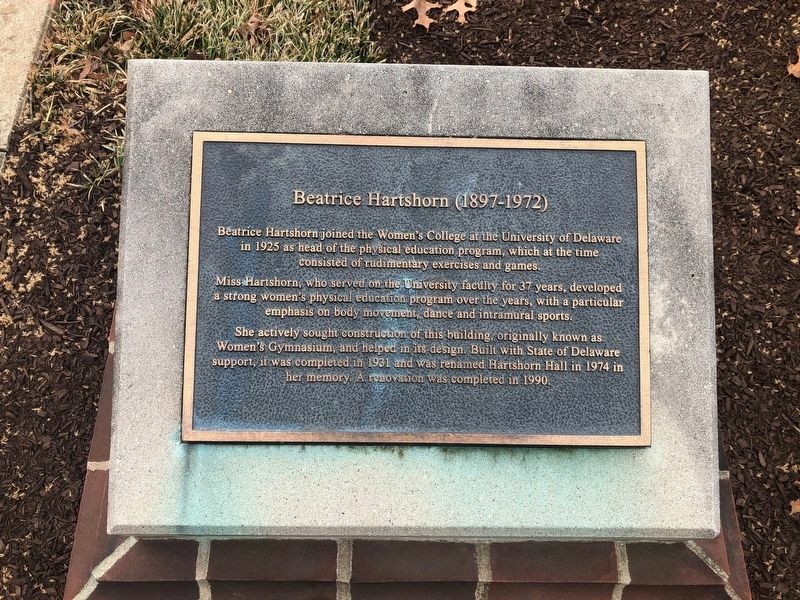 Beatrice Hartshorn joined the Women's College at the University of Delaware in 1925 as head of the physical education program, which at the time consisted of rudimentary exercises and games. Miss Hartshorn, who served on the University faculty for 37 years, developed a strong women's physical education program over the years, with a particular emphasis on body movement, dance and intramural sports. She actively sought construction of this building, originally known as Women's Gymnasium, and helped in its design. 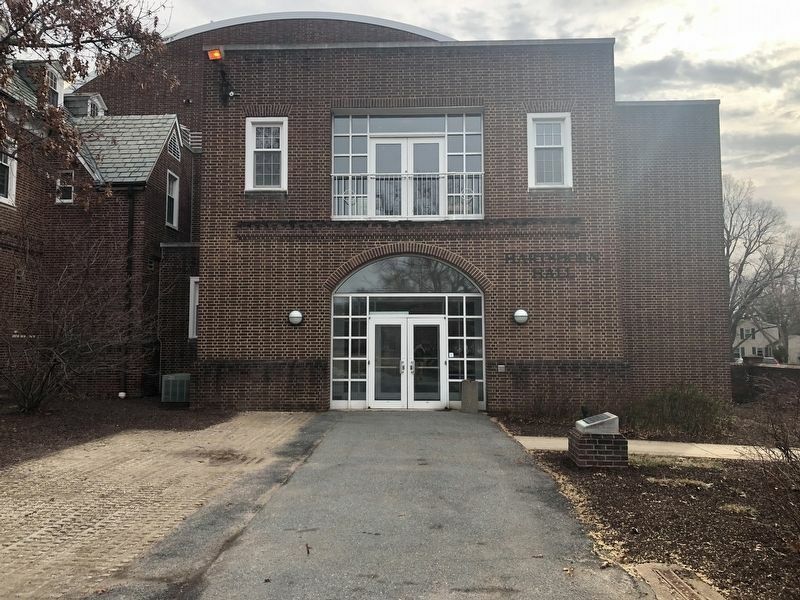 Built with State of Delaware support, it was completed in 1931 and was renamed Hartshorn Hall in 1974 in her memory. A renovation was completed in 1990. Location. 39° 40.47′ N, 75° 45.077′ W. Marker is in Newark, Delaware, in New Castle County. Marker can be reached from East Park Place west of Academy Street, on the right when traveling east. Touch for map. Marker is in this post office area: Newark DE 19716, United States of America. Touch for directions. Squire Hall (about 400 feet away); Emalea Pusey Warner (1853-1948) (about 500 feet away); Sussex Hall (about 500 feet away); Kent Hall (about 600 feet away); New Castle Hall (about 800 feet away); Winifred J. Robinson (1867-1962) (about 800 feet away); Annie Jump Cannon (1863-1941) (approx. 0.2 miles away). Touch for a list and map of all markers in Newark. More. Search the internet for Beatrice Hartshorn (1897-1972). Credits. This page was last revised on March 16, 2019. This page originally submitted on March 16, 2019, by Devry Becker Jones of Washington, District of Columbia. This page has been viewed 25 times since then. Photos: 1, 2. submitted on March 16, 2019, by Devry Becker Jones of Washington, District of Columbia.